Photo provided by Caroline Woolard. Your title in conjunction with the show is Director. Can you speak about what the role means for you? How it differs from the title of Artist or Curator? 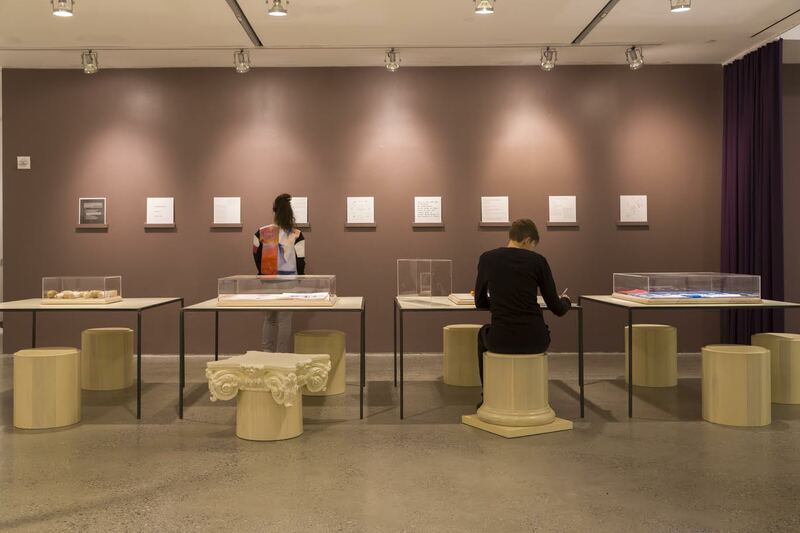 At this time, a Curator or an Artist is often understood to be a person whose individual expressions, labor, and critical thought enable a project to exist. But I want to create projects that exist beyond my initial vision; that can be modified and renewed with the energy of the people who are working on them, over years. So I am the interim Director of the Study Center because I am currently the primary person who is responsible for the long term mission of the space. The Study Center aims to mend time and attention by providing (1) practice spaces for groups, (2) a study center for sculptural tools, and (3) trainings in practices of listening, attention, and collaboration. The Director must change for the project to live on, over time, in adaptation to local contexts, so I look forward to transitioning out of this role. By naming my role within the Study Center, I am articulating the tasks that I carry out at this time, while also opening up these tasks to people in the future. I am interested in naming titles and roles that comprise the systems that I create because this allows for visible accountability and training for people who wish to move into these roles. When someone hears the title of Director, they imagine that it stands for a series of responsibilities and tasks in service to a broader mission, while an Artist or Curator is likely imagined to be responsible to their own vision, a vision that can change from every season. While I hope that the ways we understand the titles of Artist and Curator transforms in time, at this moment, the term Director conjures up associations that align more closely with my goals for longevity and strategic action. how will we learn to work together? I aim to co-create both discrete works of art and also institutions for the solidarity economy. My method is to enjoin objects to their contexts of circulation. For example, I build sculptures for barter only as I also co-create international barter networks that continue to grow; I fabricate model Shaker housing and I also convene organizers of community land trusts. I am currently working with Susan Jahoda and Emilio Martinez Poppe on a book and a card game about the commons, which could eventually live in the Study Center. But at the moment, we lack nuanced dialog and critical reflection about group work in the visual arts. This Study Center provides a space for reflection among peers, which lays the groundwork for additional feedback and deep thought about the card game and book. I find that many emergent projects make sense within collective work or institutions that must be established. As well as directing Wound, you also contributed many Ladder Chairs to the show. Could you expand on where the design of these chairs came from? I want to furnish gathering spaces with objects that are as inspired as the conversations that occur in those spaces. Ladders, like the sculptural tools in the Study Center, have functioned historically in artworks as both designed objects and also as cultural symbols. I made the ladder furniture to connect the spatial dividers of the Study Center to this long lineage of ladders from Dada, Constructivism, Bauhaus, Fluxus, and Conceptual Art. I am thinking of one of the last sculptures that Joseph Beuys made before his death (Scala Napoletana, 1985), Mel Bochner’s measurement of a ladder’s shadow (Measurement: Shadow, 1969), Man Ray’s photograph of a miniature ladder engulfed by a human foot, Alexander Rodchenko’s photographs of ladders, Yoko Ono’s ladders (Ceiling Painting, 1966, Golden Ladders, 2015), and Alma Buscher’s ladder chair (Ladder Chair for Children’s Room, 1923). Ladders have been used to stand in for aspiration, for getting ahead, and also for temporary stability, for construction of the new. The image I created for the show, which circulated months before on a postcard, is of a ladder, tipped on its side, being used as a compass. The rungs become available for the compass point as well as the tip of a mark making material. The ladder chairs I made also have a small piece of graphite, making the careful observer imagine the furniture on its side, drawing a six-foot circle. The inability of the two points—the point that creates the center of the circle and the point which draws the circle—to connect is often my experience of communication in groups. People circle around one another, unable to hear what they do not already know or think. As the Study Center is dedicated to group work in the visual arts, this concept of division through aspiration and verbal disconnect seemed important. The columns are made of turned poplar, and can be used for meetings, or they can stack to form a 10-foot column. 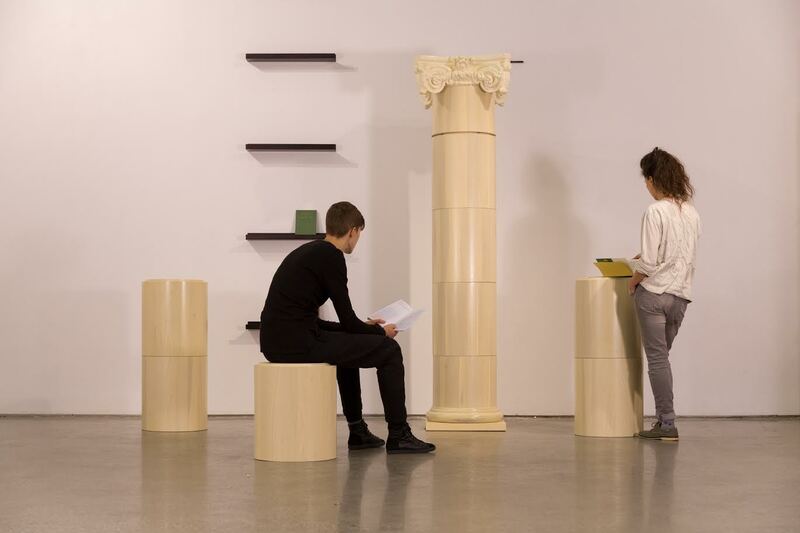 This sculptural furniture is meant to point toward the classical forms that structure social life and social space in academic settings and to the smugglers of antiquities who broke ancient columns into sections. I hope that visitors will practice assembling and disassembling these forms while thinking about the design of spaces for learning. conversations about political economy become primary. In addition to the turned poplar edition of the furniture, I have made a version that is an open source file for people with Computer Numerical Control machines to adapt. The CNC version is an example of what I call an Open Source Systems and Art project. I made the designs, files, and assembly process for this and (also for my Queer Rocker) available for use and modification because I learn by doing and by uniting research with action. I hope to add spaces of reflection and healing to social movements, so many of which are, at present, focused on protest and progress. Many students, activists, and grassroots organizations cannot afford to purchase furniture, but they may have time to create things with the materials around them. My aim with open source projects is that through communal production and alteration, an embodied politics will emerge. The tools in the show are labelled as either “On View” or “In Use”. What classifies a tool under one of these two terms? And how does the label of ‘tool’ rather than ‘sculpture’, ‘piece’, or ‘artwork’ transform the objects? A tool “In Use” is an object that will be touched, activated, and used during the time it is at Cooper Union. For example, Adelheid Mers’ The Braid is “In Use” both during her training in notation and communication methods and also throughout the duration of the Study Center’s hours at Cooper Union. Conversely, Paul Ryan’s Rose Window is “On View” because it is a delicate model that cannot be remade, so it cannot be used at this time. By referring to the objects in the Study Center as tools, I hope to trouble the autonomy we often associate with sculptures. 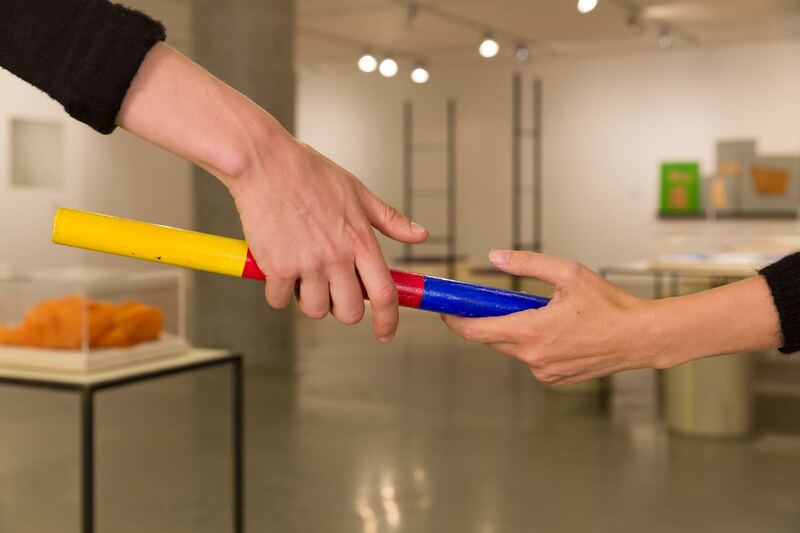 What would it mean to see all objects in exhibitions as both formal experiments in material and scale and also objects that need to be understood within a community of practice? Stamatina Gregory and I made a decision not to show any documentation (photography, video, interactive websites) of the tools in use, because we wanted to emphasize the importance of demonstration, of experience as a criterion of knowledge. In this way, all objects have the potential for use, but may be resting at this time. Collaborative time is a part of the study center’s vocabulary (used in wall text and online), and is “a time which is specifically marked by our engagement with one another.” This definition felt related to the goal of solidarity economies, where the gains made are produced from non-for-profit exchanges. For you, are these two models (collaborative time and solidarity economies) integral to one another? The term “solidarity economy” emerged in the global South (economia solidária) and is known internationally by different names: the workers’ economy, the social economy, the new economy, the circular economy, the regenerative economy, the local economy, and the cooperative economy. It is recognized globally as a way to unite grassroots practices like lending circles, credit unions, worker cooperatives, and community land trusts to form a powerful base of political power. The solidarity economy is a system that places people before profit, aiming to distribute power and resources equitably. In this way, collaboration is always already a component part of the solidarity economy. When an issue is your focus, group work becomes obvious, because the group will keep the issue alive. When we collaborate, we have to articulate our process to others, and therefore to ourselves, as well. This allows us to understand our own work and to refine our thought in debate and in encounters with difference—difference of experience, of perspective, of values. When we collaborate, we also have to accept different approaches to allocating time and money to projects, as collaborators attempt to agree upon which resources to share. In an arts ecology that privileges individual success, and that rarely flies collaborators around the world for public talks, conversations about political economy become primary. By articulating a collaborative economy of shared time and resources, students of collaboration also become students of solidarity economies, looking at shared livelihoods as always already part of shared production. The Wound Study Center is made to be on-going, (which seems inherent to the study center, since the facilitators chosen to participate engage in long-term practices). Where do you see the Study Center next, and how malleable is its format as it transitions locations and institutions? How important is it that the study center operate in an art-related environment? It is not important that the Study Center operate in an arts environment, but it is important to recognize that no new models for economic justice will be created without the arts. I see the arts as the center of all interdisciplinary work. To my mind, institutions like community land trusts, cooperative finance, and other brilliant, beautiful, systems-thinking models require the arts to envision, implement, and celebrate the unknown. The practices that the Study Center honors enable people from law, policy, finance, health, and planning to come together to create innovative models. While we see these models of credit unions, worker cooperatives, and community healing spaces, we might not realize that what brings interdisciplinary teams together are arts practices. Lastly, the arts are often the best place to test ideas for long term institutions. I have done much of the research and development of long term institutions within arts spaces. The Study Center could take a variety of forms, ranging from (1) a small display case of tools in a community center or public library to (2) a week-long study seminar for groups with daily trainings using sculptural tools. In the best case scenario, the Study Center will (3) become a permanent space for group work in the visual arts. Just as dancers take classes throughout their lives, the Study Center would be a place to take classes or use meeting spaces on a daily, weekly, or monthly basis. I would run into other members of collectives, groups, and cooperatives in class, knowing that the musculature of dialog, attention, and listening has to be practiced to become strong. For this to function, I will need to move the collection to a permanent space. I am currently in dialog with the New York Public Library and also the Brooklyn Commons about this possibility. As (4) a group of practitioners, the Study Center can exist as a consortium that offers meeting-facilitation and collaboration trainings to corporate clients as well as community based organizations using sculptural tools in unconventional environments. For example, Project 404 could teach members of a worker-owned business how to focus on a single image on their smart phone in a gallery. The Extrapolation Factory could provide futurist scenarios for activists in the basement of a museum. Wound Study Center is open by appointment until Friday, November 18 (email info@woundstudycenter.com).